Lease a mobile and reusable gate security system which is easy and quick to install. Mobile Gate Security has developed a flexible and reusable mobile gate which can quickly and easily secure access roads into and out of sites. The unique features of the mobile gate are its plug and play functionality, which means that it can be installed on site in no time at all. In addition, it is flexible and can be moved around the site as the construction work progresses and new access roads are needed. The standard mobile gate solution comprises a container which is installed with a sliding gate and gate automation. The container can also be supplied with moveable fencing, access control, boom barriers, turnstile and CCTV. 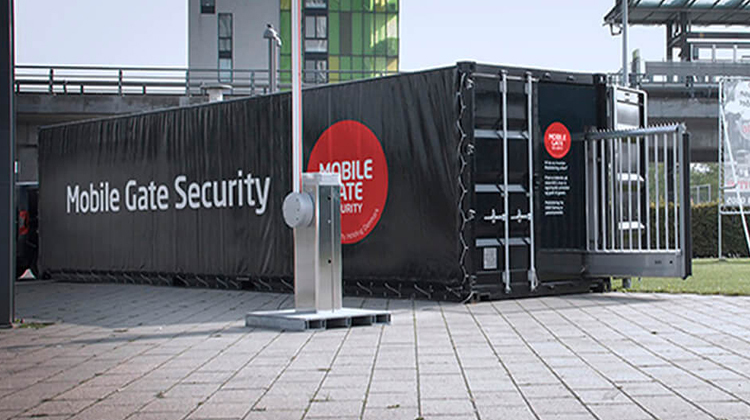 This provides an all-in-one complete mobile security solution which can secure the entire perimeter of a particular site and automatically regulate vehicular and pedestrian traffic into and out of the area. Mobile Gate Security has developed and is offering 2 models within the mobile security range of products. Model MGS20 is based on a 20” container with a build in motorized aluminum gate with an entrance opening of 4.5 mtr. The big brother, model MGS40 is a 40” container with a build in motorized aluminum gate with an entrance opening of 8.0 mtr.